Close to 30 million Americans aged 50 and older have trouble hearing. At least one million people in the country, including children and adults, are deaf. Despite these sad statistics, the Centers for Disease Control and Prevention (CDC) failed to include hearing loss in its last study on the presence of disability in the United States. The CDC study does include an examination of other common disabilities, such as vision loss. The Hearing Health Foundation spoke out about loss of hearing being left out of the study. The organization pointed out how important auditory health is, and the fact that hearing loss is the third most common public health concern after diabetes and heart disease. The Hearing Health Foundation launched a petition asking the Centers for Disease Control to rethink their approach for collecting data and do their survey over again to include loss of hearing. People often take auditory health for granted until something goes wrong. They wonder how they went from enjoying the harmonious sound of music or children’s laughter to buzzing, or faint mumbling or nothing. People can experience hearing loss for many different reasons, but there are some common causes. One of the more familiar types of hearing loss is called presbycusis. This is a condition that happens when you have been exposed to loud noises over a long period of time. This gradual loss of hearing is caused by the death of hair cells in your cochlea, which is your inner ear. This can’t be repaired, but limiting exposure to loud noises can prevent it from getting worse. Some people have a feeling of fullness in their ears that impacts their hearing. This can be mucus from an infection or an allergy that blocks the tube that connects the throat to the middle ear. Usually the hearing becomes muffled. This goes away when the infection clears up. There are cases where hearing loss is sudden. This could mean the swelling and fluid has built up as a result of a virus or ear infection. This requires immediate medical attention and medical therapies. Loss of hearing that includes dizziness, trouble with balance and nausea could be Meniere’s disease. This condition alters the amount, flow and chemical make-up of the fluid in the inner ear. Meniere’s can’t be cured, but fluid in the ear can be reduced with a low-sodium diet. In some cases, doctors will insert a tube into the ear to drain excess fluid. These are just a few examples – hearing loss can be the result of aging, injury, disease, exposure to toxic drugs or even an inherited condition. As the statistics demonstrate, hearing loss is not just a problem for the elderly. It can strike at any age. Research has shown that loss of hearing can have a considerable impact on social, psychological, as well as physical well-being. 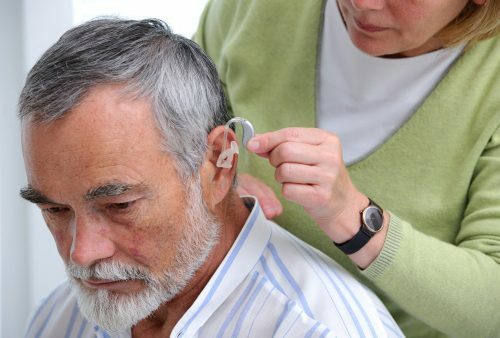 People who experience loss of hearing often have difficulty communicating, leading to negative effects on their personal and professional lives. For children, hearing loss can lead to difficulty learning, difficulty socializing and low self-esteem. When it comes to older people, it often leads to a feeling of loneliness and isolation. Many of the effects listed also apply to people who suffer from vision loss. While both vision loss and hearing loss are huge challenges, these conditions do not mean that life can’t go on. For example, several studies show that those who suffer from hearing loss are better drivers than those who don’t have hearing problems. In one Swedish driving study the results demonstrated that people with hearing loss were much more cautious behind the wheel. They lowered their speed when traffic situations became more difficult, and they checked their mirrors more often than drivers with normal hearing. The Hearing Health Foundation feels it is important to educate the public about hearing loss; after all, their mission is to eliminate it. Supporters of the foundation believe that having it recognized in the CDC study would go a long way in helping spread a message of prevention. Even though you may experience warning signs of hearing loss there are still steps you can take in order to preserve your hearing and not lose it all together. Become aware of hazardous noise and take action to protect your ears – sporting events, concerts and firecrackers all create loud and dangerous sounds. If you are attending an event which will be noisy, ensure you wear protective gear like ear plugs, or distance yourself from the source of the noise. If you work at a noisy jobsite ensure you always wear protective equipment over your ears and that you do not expose yourself to loud sounds for very long. Keep volumes on TVs, radios or other devices to a moderate level – especially if you are using headphones. The closer the sound, the lower the volume should be. Buy appliances and products which produce less noise. Go for routine hearing check-ups, especially the older you get. The Better Hearing Institute suggests that one-third of hearing loss can be avoided with prevention strategies, so even if you think it’s too late or you’re too old, by following these tips you can still work to preserve your hearing for many more years to come.